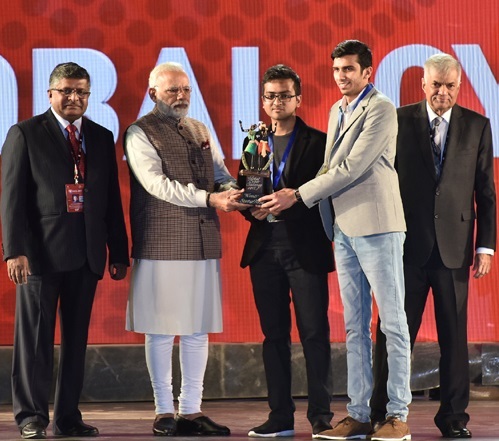 Shikhil Sharma and Ananda Krishna students of NIIT University (NU) class of 2016, won the Startup Pitch at the prestigious Global Conference on Cyberspace 2017. Astra, a web security solution, developed by these students was recognized as the “Most Innovative Startup” at the conference. The students were awarded by Honourable Prime Minister Shri Narendra Modi. Honourable Prime Minister of Sri Lanka Mr. Ranil Wickremesinghe and Honourable Minister of Law & Justice and Electronics and Information Technology, Govt. of India Mr. Ravi Shankar Prasad were also present on the occasion. Nurtured by some of the foremost thought leaders and corporate-practitioners of the country, the multi-disciplinary University focuses on emerging areas of technology and management. NIIT University is a part of a 100-acre campus at Neemrana, Rajasthan, 90 km from Gurugram on NH8.